For other Swedish princes with the name Carl, see Carl of Sweden (disambiguation). 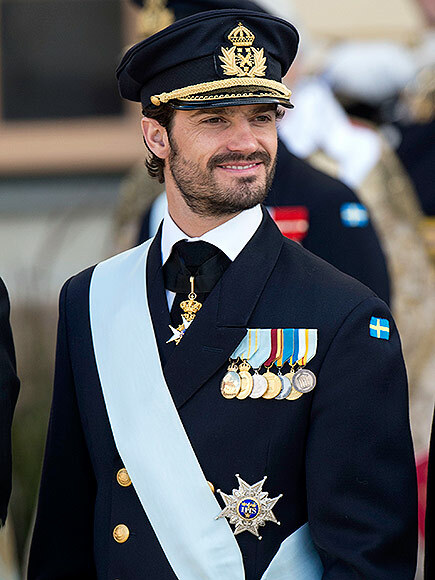 Prince Carl Philip of Sweden, Duke of Värmland (Swedish pronunciation: [ˈkɑːɭ ˈfiːlɪp]; Carl Philip Edmund Bertil; born 13 May 1979) is the only son and the second of three children of King Carl XVI Gustaf and Queen Silvia. As of 2016[update], Prince Carl Philip is fourth in the line of succession, after his older sister, Crown Princess Victoria, his niece and goddaughter Princess Estelle, and his nephew Prince Oscar. He lives with his wife, Princess Sofia, and two sons, Prince Alexander and Prince Gabriel, in Villa Solbacken in central Stockholm. Prince Carl Philip was born on 13 May 1979 at the Stockholm Palace, Sweden. He was baptised at the Royal Chapel on 31 August 1979. His mother is of half German and half Brazilian descent. Carl Philip was heir apparent to the throne of Sweden for seven months, until 1 January 1980 when a law came into effect which made natural birth order the basis for succession to the throne, replacing the principle of agnatic primogeniture. He was thereby deprived of his position as first in line to the throne, which was then bestowed upon his elder sister Victoria, with Carl Philip becoming second in line instead. During 1984–1986, Prince Carl Philip attended the Västerled parish preschool. In the autumn of 1986, he started school at Smedslättsskolan in Bromma which he attended at junior level. For the intermediate level, he attended Ålstensskolan in Bromma, proceeding from there, in the autumn of 1992, to senior level at Enskilda Gymnasiet in Stockholm. In the autumn of 1994, Carl Philip enrolled at Kent School. He then continued his studies in a science programme at Lundsbergs upper secondary school. He graduated in the spring of 1999. In 2007-2008, he studied graphic design at the Rhode Island School of Design for one year. In 2011, Prince Carl Philip finished his studies in Agricultural and Rural Management at the Swedish University of Agricultural Sciences in Alnarp. Prince Carl Philip has been a scout and is fond of outdoor life. He is keen on sport and athletics, especially football, swimming, sailing and skiing. In 2003, he completed the historic Swedish "Vasaloppet", the longest cross country ski race in the world. Carl Philip also enjoys car racing, a passion he inherited from his great-uncle and godfather, Prince Bertil, and has a licence to compete. Prince Carl Philip has taken part in the racing series Porsche Carrera Cup Scandinavia in a Porsche 911 GT3. Since 2013 he has raced in the Scandinavian Touring Car Championship. The prince completed his military service at the Amphibious Battalion at Vaxholm Coastal Artillery Regiment as a combat boat commander (Combat Boat 90) in the autumn of 2000. In December 2002, the Prince was promoted to fänrik (midshipman), and in 2004 to the rank of löjtnant (sub-lieutenant) in the Swedish Navy. In 2007 and 2008 he went to the Swedish National Defense College. The course was divided in three weeks autumn 2007 and three weeks spring 2008. After that course he was appointed kapten in the Swedish Navy (lieutenant). On 1 October 2014, Prince Carl Philip achieved the rank of major. With a great interest for design and drawing, the prince began studying graphic design in Stockholm in 2003, studies which he continues still. Prince Carl Philip dated Emma Pernald from 1999 to 2009. Pernald worked at a PR firm for several years. However, the prince and Pernald broke off their relationship in March 2009. She revealed in the Swedish newspaper Expressen that she and the prince mutually decided to go their separate ways. Pernald made no further comment as to the reason for the break-up. In April 2010, Carl Philip was linked in the press with former glamour model Sofia Hellqvist. In August 2010, Royal Court spokesperson Nina Eldh confirmed the relationship between Carl Philip and Hellqvist in a statement released by the palace. 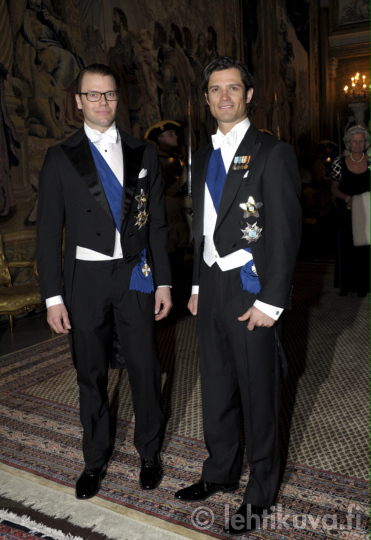 On 27 June 2014, it was announced that Carl Philip and Hellqvist were engaged. They married on 13 June 2015 in Stockholm's Royal Palace chapel, and thousands of people lined the streets for the occasion. In an interview he criticized the press for suggesting that Hellqvist was not welcome in the royal family. He told the press that the opposite was true and that his family easily accepted her into the family. He compared the "bullying" of her past to that of himself being bullied for having dyslexia. On 15 October 2015 it was announced that the couple is expecting their first child, due in April 2016. On 19 April 2016, Princess Sofia gave birth to a son, Prince Alexander, Duke of Södermanland. On 23 March 2017 it was announced that the couple were expecting their second child. Their second child, a son, was born on 31 August 2017, titled Prince Gabriel, Duke of Dalarna. Prince Carl Philip's coat of arms is based on the greater coat of arms of Sweden. It features in the first and fourth quarters, the Three Crowns; in the second, the lion of the House of Bjelbo; and in the third, the eagle of the arms of Värmland, representing the titular designation of his dukedom. In the centre, on an inescutcheon, is the dynastic arms of the House of Bernadotte. Surrounding the shield is the chain of the Order of the Seraphim. ^ a b c d e "Biografi" [Biography] (in Swedish). Royal Court of Sweden. Retrieved 20 April 2016. ^ His godparents are: Princess Birgitta of Sweden (paternal aunt) Prince Bertil, Duke of Halland (paternal great-uncle), Queen Margrethe II of Denmark (paternal grandfather's niece through his sister Ingrid of Sweden) and Prince Leopold of Bavaria. ^ "Historical Museum Gets a New Identity". RISD. Archived from the original on 22 December 2015. Retrieved 18 December 2015. ^ "The Prince Won Prestigious Design Competition in the U.S." Royal Court of Sweden. 1 January 2008. Retrieved 18 December 2015. ^ "Prince Carl Philip on his university diploma in Agricultural and Rural Management". Royal Court of Sweden. December 2011. Retrieved 25 May 2012. ^ "Volvo Polestar Racing avslöjar sin föraruppställning". www.stcc.se. Scandinavian Touring Car Championship. ^ "H.K.H. Prins Carl Philip / Biografi". Royal Court of Sweden. ^ "Prins Carl Philip utnämnd till löjtnant den 14 december". Royal Court of Sweden. 14 December 2004. ^ "Prins Carl Philip utnämns till major". Royal Court of Sweden. 1 October 2014. ^ Streib, Lauren (27 May 2008). "The 20 Hottest Young Royals – 9. Prince Carl Philip". Forbes. Retrieved 19 June 2010. ^ a b "Reality starlet to wed prince in Swedish fairytale". Yahoo News. 11 June 2015. Retrieved 11 June 2015. ^ "Sweden royal wedding: Prince Carl Philip to marry ex-reality star". BBC News. Retrieved 13 June 2015. ^ Squires, Nick (8 April 2010). "Swedish prince has relationship with glamour model". The Daily Telegraph. UK. Retrieved 19 June 2010. ^ "Sweden royal wedding: Prince Carl Philip marries ex-reality star - BBC News". Retrieved 11 June 2016. ^ "Vigsel mellan Prins Carl Philip och fröken Sofia Hellqvist". Retrieved 23 October 2014. ^ "Swedish prince angry over press 'bullying'". Retrieved 20 October 2014. ^ He has a daughter, her name is Matilda Victoria Maria (04/19/2016). ^ "Sweden's Princess Sofia Is Pregnant With Her First Child!". Retrieved 11 June 2016. ^ "Announcement from the Marshal of the Realm". Retrieved 19 April 2016. ^ "Prince Carl Philip and Princess Sofia have had a son". Retrieved 19 April 2016. ^ "Announcement from the Marshal of the Realm". ^ "Carl Philip får Upplandsmedaljen". 1 October 2008. Retrieved 11 June 2016. ^ "Meet Prince Carl Philip of Sweden, Your Real-Life Prince Charming". Retrieved 11 June 2016. ^ "Kronprinsessan och Prins Carl Philip på Försvarshögskolan - Sveriges Kungahus". Retrieved 11 June 2016. ^ "Prins Carl Philip gav företräde för Fredsbaskrarna - Sveriges Kungahus". Retrieved 11 June 2016. ^ "70th anniversary of king Carl Gustav of Sweden in Stockholm Sweden on... Fotografía de noticias 115116367 | Getty Images". dailymail.co.uk. 2 May 2016. Retrieved 9 May 2016. ^ "State Visit from Germany to Sweden; May 20-22, 2003". The Royal Forums. Retrieved 17 May 2014. ^ "030520 State Visit from Germany's President Johannes Rau, Drottningholm Palace, near Stockholm - Princess Madeleine of Sweden". Retrieved 11 June 2016. ^ "050914 State visit from Malaysia, Stockholm Palace - 03-SWEDEN-MALAYSIA-ROYALS003 - Princess Madeleine of Sweden". Retrieved 11 June 2016. ^ "050901 State visit from Norway, Royal Palace, Stockholm - 03-CH05090151 - Princess Madeleine of Sweden". Retrieved 11 June 2016. ^ "050901 State visit from Norway, Royal Palace, Stockholm - 01-CH05090114 - Princess Madeleine of Sweden". Retrieved 11 June 2016. ^ "Statsbesök från Tunisien – dag 1 - Sveriges Kungahus". Retrieved 11 June 2016. Wikimedia Commons has media related to Prince Carl Philip, Duke of Värmland.